Aketon Cottage is a beautifully presented three bedroomed detached cottage with oil fired central heating, according to agents Hopkinsons. 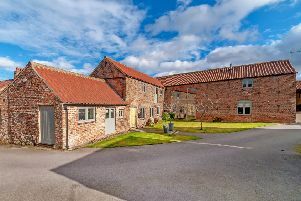 Features include a hall, lounge with a log burning stove, garden room, fitted quality kitchen with electric Aga, spacious rear utility room with Grant oil fired boiler. The master bedroom has a walk in dressing room, en-suite bathroom with a shower. There are two further bedrooms and a luxury house bathroom. There is a double garage. Phone Hopkinsons on 01423 501201.